...I am sooooo tiried of reading blog post after blog post about how the iPhone 4S is a marginal update, or barely an update. Or you pick the negative retort. Because when I sat there on Tuesday and was reading about all the new features being announced - I was thinking - Wow this is as big an update as the iPhone 4 was vs the 3GS. So I need to ask - What are all those that are bemoaning the iPhone 4S really upset about? Seriously - I am asking. Because I don't have a clue what they are thinking. It actually made it to the point where I started to question my sanity on this matter - so I decided to put together the chart you see above. What I did in this chart was put in all the new features of the iPhone 4 vs what was in the iPhone 3GS. And then also all the new features of the iPhone 4S vs what is in the iPhone 4. And when I was done with the chart - I felt a lot better - No I am not crazy - the iPhone 4S really is as big an update from the iPhone 4 as the iPhone 4 was from the 3GS. Still don't believe me - then go back look over that chart again. Actually I find when looking at all the changes objectively - the 4S is actually a bigger update than the 4 was. Clearly calling it the iPhone 4S - in some peoples mind is the real reason they are feeling it is not as big an update - which is pretty lame for so called tech journalists. Sure - I would have liked to see it called the iPhone 5. But either way it is still a major update. Some reasons I think Apple went with the 4S vs 5 name is that with the 3G and 3GS - they both had the same case. So to with the 4 and 4S. Also in 2012 - with the 6th iPhone (dare not say iPhone 6) - it is likely going to be LTE - it will also likely not be released until the fall of 2012 as well. And when this 6th iPhone is released - it will NOT be called the iPhone 5 - it will be called the iPhone 4G - as in LTE = 4G. And guess what it is likely going to be in the same package as the 4 and 4S. I read in a post where someone said they are just waiting for the iPhone 5 - well guess what the iPhone 4S really trully is the iPhone 5 - it is just not called the iPhone 5. Per all those rumors about teardrop packages, wider and bigger screens and 4G be it LTE or WiMax - those never made any sense this year. And other than LTE - I don't see any of them making sense next year. So next time you read a post about someone bemoaning the iPhone 4S - send them the link to the chart above and ask them to justify their position based on that REAL info. 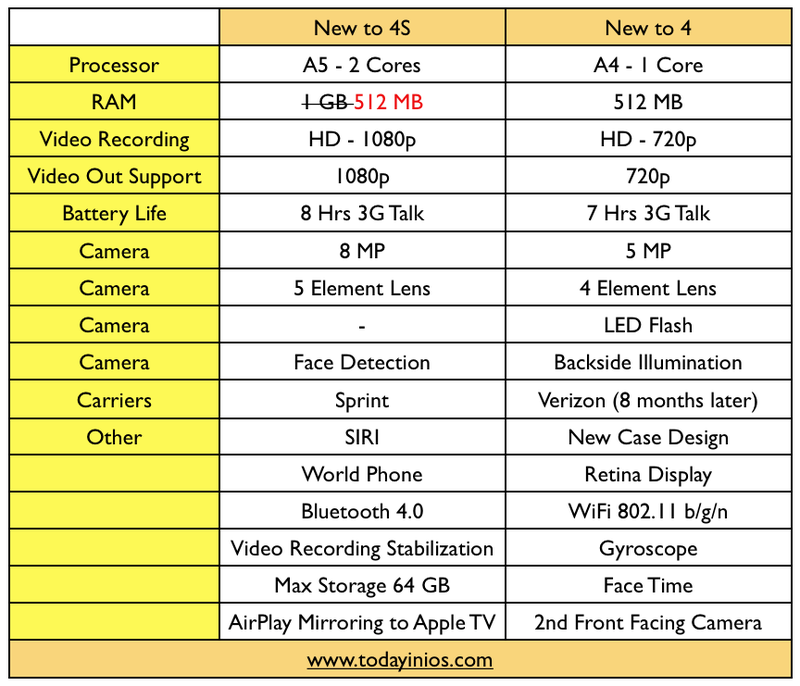 UPDATE: I updated the graph to better illustrate all the specs of the iPhone 4S. In the graph now the top 7 iteams are all improvements vs the 4. The last 8 items in the 4S column are all new just to the 4S. Plus the last 9 items for the 4 are ofcourse also in the 4S - incase you want to compare vs the 3GS. No mater how you slice it the 4S is a great device. UPDATE2: iFixit has opened up an iPhone 4S and sadly it is still at 512 MB of RAM. Chart has been updated accrodingly.